Annoying SBless failures like the Cards ane Vikes thinking they have business in big games, am I right? I mean, you know they will never finish the deal with a SB win. Re: You know what really gets me? Stay true, Ponyboy. Enjoy your NFC North title. dead_poet wrote: Stay true, Ponyboy. Enjoy your NFC North title. Enjoy your history of not ending every single season with failure. Honestly who cares about your div title, we have the same record this year except we have a playoff win while your last was in 09. In fact you could make a real case that the last 5 Seasons of our history trump your entire existence as a franchise. I mean, really, not trying to be mean, but is there anything to suggest otherwise? Seriously? One thing? One reason that may not be true? 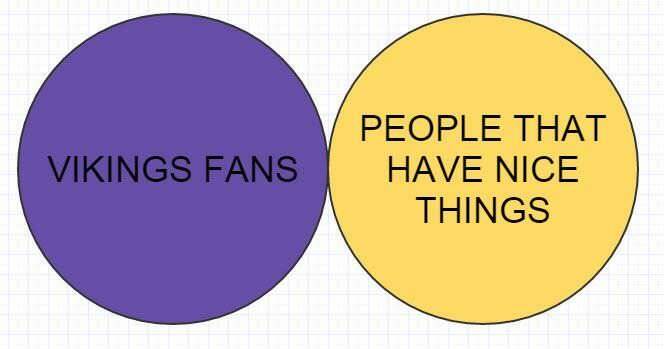 You are almost acting like I have qualms with the Vikes right now, which couldnt be further from the truth. Jordysghost wrote: You are almost acting like I have qualms with the Vikes right now, which couldnt be further from the truth. Dude you are so full of crap. Who posts on a Viking message board during a Puke /Cardinals play-off game You have probably gotten kicked off of every Puker board that there is and now resort to posting on the VMB more than almost any Viking fan. Purple bruise wrote: Dude you are so full of crap. Who posts on a Viking message board during a Puke /Cardinals play-off game You have probably gotten kicked off of every Puker board that there is and now resort to posting on the VMB more than almost any Viking fan. Bwaha are you kidding? We have Aaron Rodgers and a great young D, the playoffs are a foregone conclusion for us, you beat us once we beat you once except we whupped the tar out of you. I don't live in the past, you just cling to hope to the future because you have nothing else, we were better in the past, we are better now, and we will be better in the future, because we are a better organisation. Yup, indisputably missed call led to 7 for the Cards and we forced it to OT, we obviously win if the right call had been made, or if our top 3 WRs weren't out. Its cute how you think because for once you didn't get swept by GB that you are going to be the top dog from here on out, lmao, no. I like Bridge alot, but it is clear you have a pretty low ceiling with him at QB, i mean, do you ever really foresee him being anything above 'Alright'?